Players react to a shot by a Union player. 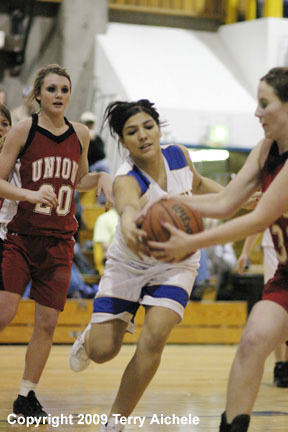 STANFIELD - The Union Lady Bobcats defeated their hosts, the Stanfield Tigers 52-44 on Saturday, January 10, 2009. The taller Bobcats controlled the action in the second half of the game. The Tigers lead at halftime but things would turn tough for Stanfield in the second half. Stanfield lead 4-0 early in the first period. It was nearly three minutes later that Union closed to tie it up 6-6. Stanfield then took the lead back until Union took the lead at 12-11 with three minutes to go in the period. The Bobcats held the Tigers scoreless for the last minute and a half to finish with a 18-13 lead. 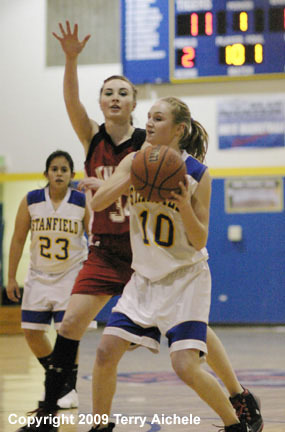 Stanfield held Union to two points for the first three minutes of the second period while scoring seven points to tie it up 20-20. The teams exchanged the lead through the next several minutes with Stanfield leading at halftime 26-24. 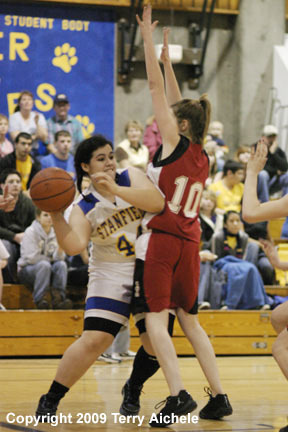 Stanfield hopes fell on Mikayla Baros, Tara Nichols, Jessinia Carrillo, and Erica Gehrke to match up to the physically bigger Bobcats. Union practically shut off the Tigers in the third holding the Tigers to just two points while hitting 14 points to take a 38-28 lead. LEFT - Mikayla Baros of Stanfield stretches to reach the basketball along the baseline while being closely guarded by Union defenders. 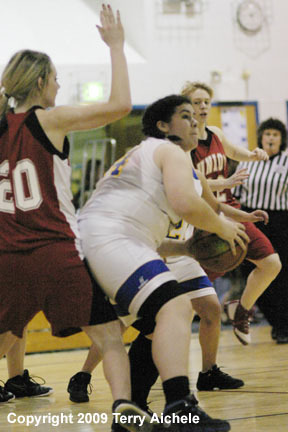 RIGHT - Erica Gehrke of Stanfield sets up for a shot. 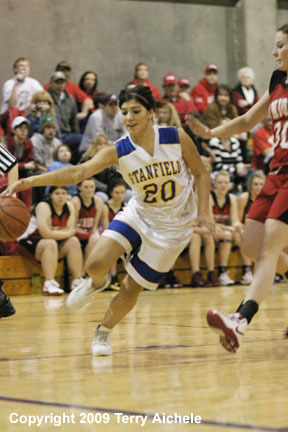 LEFT - Alyssa Sobotta of Stanfield cuts towards the basket.. 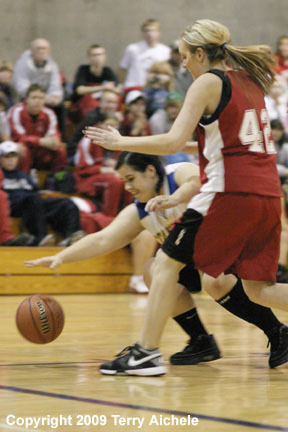 RIGHT - Mikayla Baros of Stanfield rolls around Anna Courtney of Union on her way towards the basket. LEFT - Alyssa Sobotta of Stanfield battles with a Union defender for control of the ball. 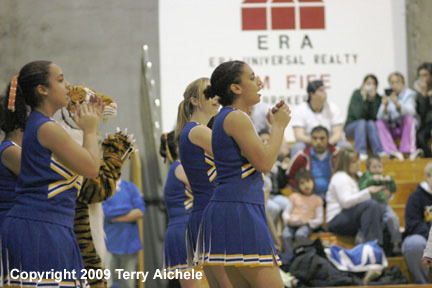 RIGHT - Stanfield cheerleaders and fans yell their support for their team.